I pulled a well-worn copy of a 1981 Amarillo Historic Building Survey off my shelf, wondering if I could identify 10 such homes here. Immediately, I knew I’m neither up to the task – nor the second-guessing – of choosing which buildings have been significant to how Amarillo dwells. So this is not so much a Top Ten as a Notable Ten. It focuses on lesser-known digs and draws heavily from the survey, the National Register of Historic Places, and the Amarillo Public Library’s historic photo archives. 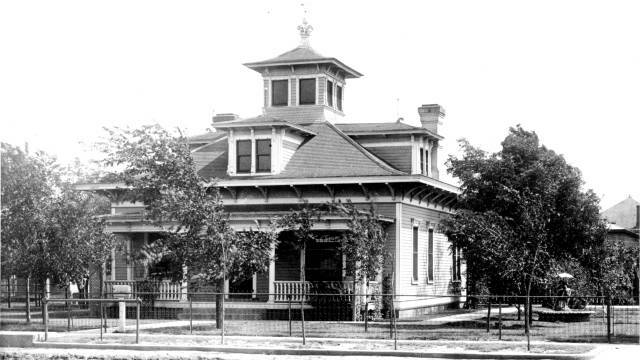 The Henry B. and Ellen M. Sanborn House is another bit of transplanted Amarillo history. It originally was constructed in 1902 on a block of South Buchanan Street that now is part of the Amarillo Civic Center and City Hall complex and was moved in 1922 to make way for the Municipal Auditorium that the complex would eventually replace. Often called the father of Amarillo, Sanborn was chief salesman for barbed wire invented by Joseph F. Glidden. He and Glidden established the 250,000-acre Frying Pan Ranch in Potter and Randall counties in 1881. Another home made its move across Amarillo in 1947. The Smith-Rogers Home now at 4841 S.W. Ninth Ave., at Avondale Street, originally was constructed in 1903 at 1101 S. Taylor St. Originally, it was the home of James Lowry and Marie Bynum Smith, who moved to Amarillo in 1888. He began one of Amarillo’s first banks. Tucked behind another structure, you’ll still find the Louis McGee/Neal S. Griggs House, which has the address of 307 S. Harrison St. McGee built the one-story brick structure in 1901, and Griggs, the funeral businessman, occupied it until the 1940s. It’s reported to be the oldest surviving brick building in the city. In that same vein, the Talmage Apartments brought high-rise urban living to Amarillo in 1927. Amarillo architect Guy Carlander supervised construction of the five-story brick building at 1401 S. Van Buren St. – advanced for its electric elevators, walnut doors and the city’s first parking garage. Baptist Community Services purchased the building in 2000 and renovated it as independent-living apartments for seniors in its Park Central community. At 913 S.W. Sixth Ave., you’ll find the earliest known example in Amarillo of a residential building type that began in Southern California around 1905 and swept across the nation – the Bungalow Court. The structure here was built in 1922 as Virginia Court. The bungalow arrangement boosted how many people developers could fit on increasingly expensive urban land, while still giving those folks a single-family living environment. This property consisted of four gable-roofed cottages in two rows facing a narrow court. And now for something completely different: The Harry Holland House at 2500 S. Van Buren, a Streamlined Moderne house built in 1937 by two of Amarillo’s most known architects, Macon O. Carder and E. F. Rittenberry. It’s a two-story, stuccoed, modern home set in a virtually treeless lawn. Harry Holland was a department store owner. Yet other examples of the Streamlined Moderne exist in Amarillo, including a 1936 structure at 2200 S. Ong St.
And finally, just because I would like to have seen this place, I list The Reid. Mrs. Bertha Reid was its proprietor in 1917, although it subsequently changed hands. It was a three-story boarding house at 800 S. Tyler St. that burned in a fire in June of 1917. Childers: "This political environment is caustic"